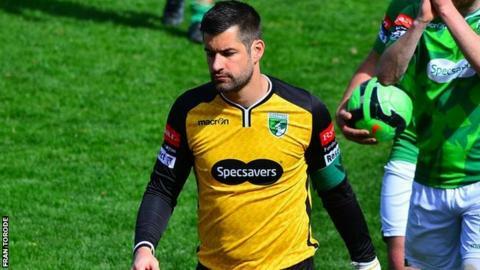 Guernsey FC goalkeeper Chris Tardif says the club are capable of being promoted to the Isthmian League Premier Division next season. The ex-Portsmouth and Oxford United player, 35, has been first-choice keeper since Guernsey were formed. "I truly believe what we've done this year will put us in good stead for next season," Tardif said told BBC Guernsey. "I really hope that we get to where I think we can achieve as a minimum, which is the Ryman Premier." Guernsey, who made the end-of-season play-offs in their first campaign in the Isthmian League Division One South, finished 10th this season. "It's the end of a really tough season, we've learnt a hell of a lot about each other this year," Tardif said. "The honeymoon is over, this is real football. This is what it's like for most footballers week in, week out. "You don't always play for promotion, although I still believe we should be playing for promotion."